A swallow necklace with a freshwater pearl on a 16′ silver snake chain. This pretty necklace it the perfect gift for any occasion. Availability: 4 in stock Size: N/A Categories: All Jewellery, Necklaces, Collections, Wings, Wedding Jewellery, Wedding Gifts. 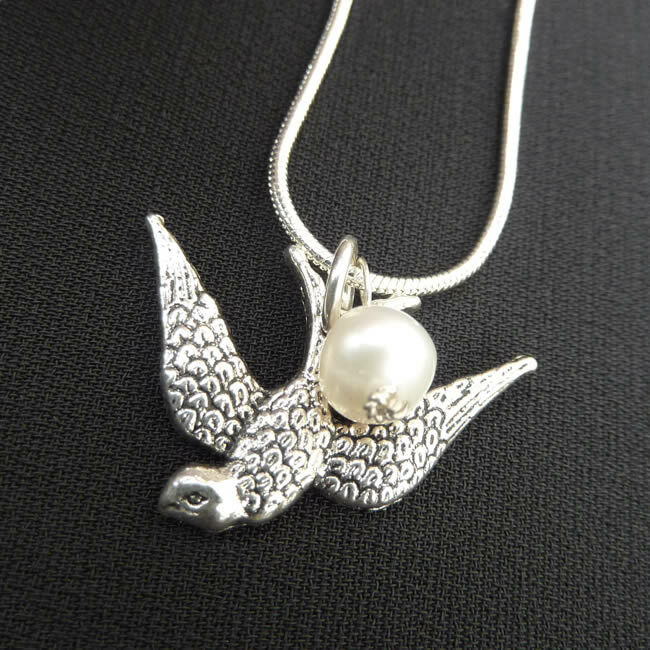 Tags: bespoke silver, bird charm, birds necklace, freshwater pearl, handmade silver, jewellery designer, jewellery maker., liverpool, LWSilver, pewter, silver, silversmith, sterling silver, swallow charm, swallow necklace, uk, wirral. Materials: 925 sterling silver/Pewter/Freshwater pearl. I love this necklace so much and always get lovely comments about it. Looking fwd to adding to my lwsilver collection! I bought this necklace for my daughter and she loves it so much she never takes it off. This necklace is so pretty and individual. I bought it for a friend and keep looking at it because I want one too!! !